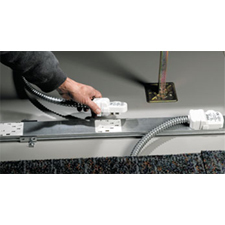 In order to make cable runs quicker and more efficient to install — as well as allow for easily implemented re-distribution of under floor power over time — Snake Tray offers its modular, snap-in-place underfloor electrical busway, the Snake Bus. Snake Bus is essentially a series of pre-configured components that snap together to form the Snake Bus track, onto which Snake Whips (tap offs) can be added to power individual devices anywhere along the track. The track delivers 50 Amp 3-Phase 208 Volt providing up to 17.5 kilowatts of power. Jette detailed several advantages, including “10-second” change-outs of the Snake Whips from one location to another along the track. Snake Bus also speeds overall building design and construction, he added. Additional features include innovative bus bar technology that is more efficient than traditional copper wire, Jette added, which in turn makes the system “green” in more than one way. First, the system’s bus bar technology experiences less voltage drop than traditional copper, which can save on energy consumption. Next, a properly installed Snake Bus system will use approximately 30% less copper than traditional wiring. “Because there are so few home runs, you are taking things out on a bus, so the consumables of the system consume less copper,” Jette explains. “If you ran a discrete drop to every device, you are running a lot more copper. Consolidating the electric raceway in this way does not use as much copper." Snake Bus offers both the equipment and isolated earth ground in one single system, and is designed to fit in a space less than 2 1/2 inches in height, allowing for proper airflow under an access floor. Jette said the system is ideal for workstations, call centers and trading floors, among others, adding a very visual description of the Snake Bus system.